When it comes to gas and electric water heaters, Washington, DC, Maryland, and Virginia residents and business owners know who to call: John G. Webster. For over a century, John G. Webster plumbers have consistently provided the Washington metro area with the very best water heater service, from repairs to new equipment installation. Did you know an average water heater’s lifespan is just 12 years? Many home and business owners don’t know how old their water heaters are, putting both their families, employees, customers, homes, and businesses at risk for flood and mold damage. Many homeowners are surprised to discover that today’s water heaters are far safer and more efficient than older models. If you’re tired of running out of hot water, you can easily upgrade to a larger or fast-recovery model. 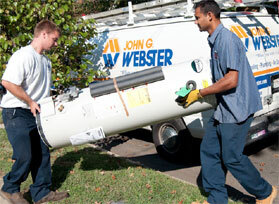 John G. Webster offers speedy installation on today’s best water heaters at reasonable prices to meet your budget. We even offer service agreements to keep your water heater running at peak performance, eliminating costly repairs, overtime fees, and unneeded fuel usage. We only hire the best and brightest plumbers. They are continually learning the newest technologies, and will treat your home or business with respect. From permits to inspections, John G. Webster is focused on safety. We’re bonded, licensed, and insured to keep you at ease while we’re hard at work. Need water heater repair or installation? Contact us today!